Change things up with a short trip to Catedral de Sal in Zipaquira (about 50 minutes away). There's much more to do: examine the collection at Gold Museum (Museo del Oro), contemplate in the serene atmosphere at Mount Monserrate, admire the natural beauty at Jardin Botanico de Bogota Jose Celestino Mutis, and don't miss a visit to Casa Libreria Wilborada 1047. For reviews, photos, and other tourist information, you can read our Bogota vacation builder. Brussels, Belgium to Bogota is an approximately 19.5-hour flight. The time zone difference moving from Central European Time (CET) to Colombia Time (COT) is minus 6 hours. In June, daily temperatures in Bogota can reach 22°C, while at night they dip to 11°C. Finish your sightseeing early on the 20th (Tue) to allow enough time to travel to San Andres Island. San Andres Island is known for nature, sightseeing, wildlife areas, beaches, and adventure. 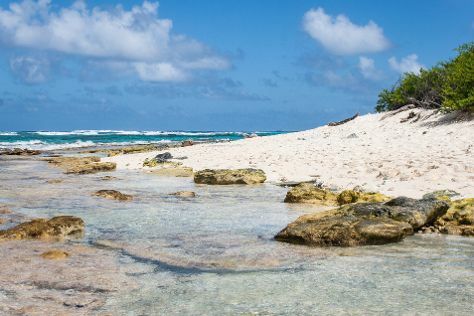 Your plan includes some of its best attractions: step off the mainland to explore Johnny Cay, look for all kinds of wild species at La Piscinita, stroll through Playa de San Luis, and make a trip to Blow Hole. To find where to stay, ratings, reviews, and other tourist information, go to the San Andres Island trip planner. Traveling by flight from Bogota to San Andres Island takes 2.5 hours. While traveling from Bogota, expect somewhat warmer days and much hotter nights in San Andres Island, ranging from highs of 35°C to lows of 30°C. Finish up your sightseeing early on the 23rd (Fri) so you can travel to Cartagena. On the 23rd (Fri), steep yourself in history at Walled City of Cartagena and then step into the grandiose world of San Felipe de Barajas Castle. Here are some ideas for day two: pause for some serene contemplation at Sanctuary of Saint Peter Claver, get engrossed in the history at Museo del Oro Zenu, contemplate the long history of Plaza Santo Domingo, admire the striking features of Las Bovedas, then contemplate in the serene atmosphere at Convento La Popa de la Galera, and finally make a trip to La Popa Monastery. For where to stay and tourist information, use the Cartagena trip itinerary maker. Fly from San Andres Island to Cartagena in 2 hours. In June, daily temperatures in Cartagena can reach 38°C, while at night they dip to 30°C. Wrap up your sightseeing on the 24th (Sat) early enough to travel back home.